A new graphic novel by the European Youth Press explores the state of free press in Europe as seen through the eyes and pens of young European cartoonists and journalists coming into their craft. Entitled Free Our Media, the graphic novel is the collaborative effort of 15 cartoonists and journalists from 15 different European countries, exploring the challenges faced by the press. The goals of the project are to not only raise awareness of the limitations of today’s press, but also to create a space that encourages debate about these important issues. Young people from 15 countries will take up an active role in developing an action-oriented long-term strategy on Media Freedom, by working on a comic book and an online educational platform, for young journalists to defend and enhance media freedom in Europe. All around the world we are seeing cartoonists using the graphic medium coupled with technological advancements as a way to not only express themselves and get their materials out, but also as a way to circumvent the obstacles posed by the governments in their respective countries. 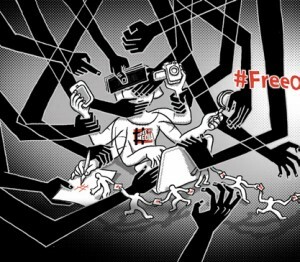 Whether it be the burgeoning independent comics scene in Egypt or crowdfunding in Lebanon, the world has become a lot more connected and now more than ever eyes are on the global state of free press. You can check out a preview of the comic on the European Youth Media’s website here.